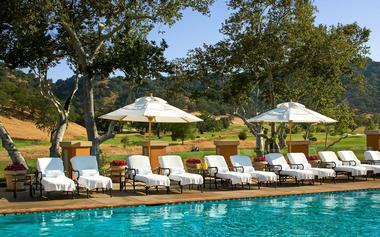 Rosewood CordeValle is located in California wine country, in the foothills of the Santa Cruz Mountains. Only 30 minutes south of San Jose, and 45 minutes north of the Monterey Peninsula, the resort is handy for residents of northern California, visitors to San Francisco, and all who love the combination of a natural landscape and a luxury resort. Rosewood CordeValle is home to an 85-acre vineyard and winery, and an award-winning championship golf course designed by Robert Trent Jones. 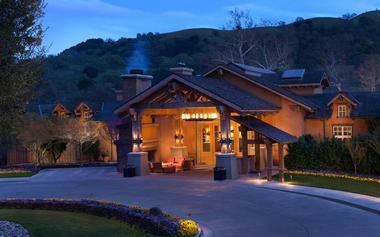 The resort sits on 1,700 acres of rolling hills, and is designed in California craftsman-style architecture and décor. 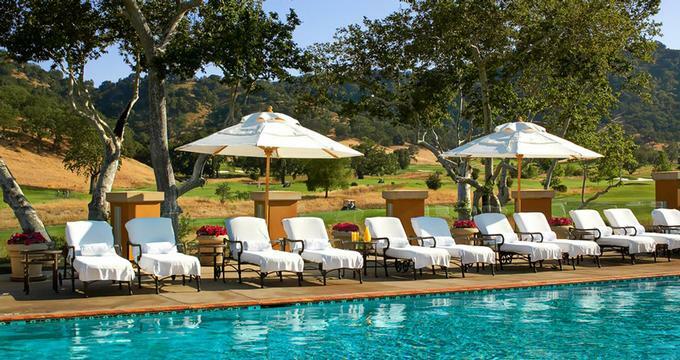 Rooms, suites, and villas at Rosewood CordeValle are lush and gorgeous. Each room has a king bed decked out with goose-down comforters; original artwork hangs on the walls and the oversized bathrooms are luxurious. 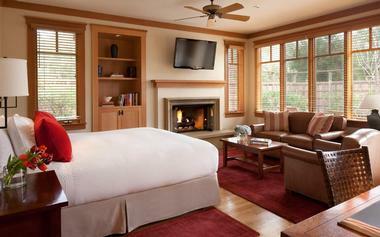 Every room has a flat-screen TV, a fireplace, an in-room safe, a wet bar, a fridge, and plush bathrobes and slippers. The huge bathrooms have double vanities, a glass-walled shower, and a large jetted tub. All rooms receive twice-daily housekeeping. The Fairway Rooms are located next to the golf fairways, and are 550 square feet. They have a sitting area, a desk, a private patio, and a walk-in closet. The Bungalows are similar to the Fairway Rooms, only larger, and set on a hillside overlooking the 9th hole fairway. The Villa Suites are an expansive 1,000 square feet, and have golf course views. The wide entrance foyer leads to a sitting area with a large, sunny patio. The bedroom is filled with light shining through its French doors, and has its own sitting area. The enclosed patio of each Villa Suite has an outdoor shower and a private whirlpool tub. The living room is furnished with leather chairs, and has floor to ceiling windows with beautiful valley views. The Fairway Homes are the ultimate in indulgence. There are four master bedrooms circling the large central area, which contains a living room, a butler's kitchen, a dining room, a half-bathroom, and a common patio. Each of the large master bedrooms has its own separate entrance from outside, a private bathroom opening to a private garden, and a private patio. Every bedroom has its own fireplace and refrigerator. 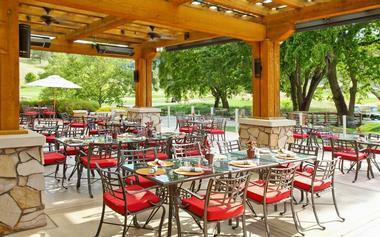 Rosewood CordeValle has three excellent restaurants that are open only to guests of the resort. Their menus change seasonally, and reflect the harvest bounties from local organic grower and the yield from the resort's own herb and vegetable garden. The contemporary California menus have options for vegetarian and gluten-free diets. Il Vigneto serves a blend of Italian and California cuisine, and is open for dinner daily. Appetizers include inventive salads such as avocado and papaya; thinly sliced beef encrusted with Dijon and truffles, and wild mushroom soup. Entrees include Wild Alaskan Halibut; King Salmon; Brick-Roasted Chicken; Grilled Angus Ribeye Steak; Porcini Mushroom Ravioli; and Colorado Rack of Lamb. The Lion's Peak Grill is open for breakfast and lunch, and reopens in the evening as a cocktail bar. This informal 48-seat restaurant is located on an outdoor patio for al fresco dining. Breakfasts include bacon; eggs; toast; breakfast burritos; omelets; sausage, and fresh fruit. For lunch, diners may feast on salads; quesadillas; chicken wings; loaded nachos; sandwiches and wraps; and hot dogs and burgers. One Iron Bar overlooks the hills and the golf course. It uses local ingredients, and is open for three meals a day. Diners may enjoy sipping on its speciality cocktails or drinking wine from the resort's own winery, Clos LaChance. The breakfast menu includes egg dishes from free-range chickens; oatmeal;lox and bagels; pancakes, and freshly-squeezed juices. Lunch and dinner menus have delicious appetizers, such as cauliflower with a blue cheese sauce, grilled artichoke or asparagus, calamari, oysters, or an antipasto platter. Entrees include salads on their own or topped with a choice of kobe beef, Asian chicken, or seafood; burgers; vegetarian or meat-based wraps; vegan ravioli; mushroom risotto; roast chicken;filet mignon, and coconut crusted prawns. There is a delicious array of desserts, such as beignets; cheesecake;gluten-free chocolate decadence; a vegan berry cobbler, and house-made gelato and sorbet. The Cordevalle Dream Treatment lasts three hours, and revives the senses with a full body salt scrub, a warm stone massage with custom-blended essential oils, and a facial designed with the client's skin type in mind. Raindrops from the Vine is a two-hour treatment that begins with a private steam in the rain room, exfoliation with an anti-oxidant rich grapeseed wrap, and a scalp and neck massage while the wrap is at work. The treatment concludes with a water massage from a shower of Vichy water, and a full body massage. Bungalow Love is a two-hour treatment for two; it starts with exfoliation and a shared rinse, then a massage, a soak in a bubble bath, and concludes with tasty treats and champagne to be sipped at leisure. 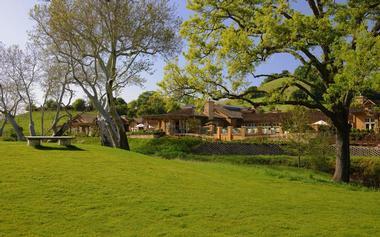 The Cordevalle Journey is the ultimate in invigoration and relaxation. Guests begin with a guided fresh air hike into the surrounding hills, and a light lunch. Afterwards spa guests will be pampered with a two-hour head to toe massage including the scalp and feet, and a customized facial. Rosewood CordeValle has a 260-acre, 18-hole, par 72 golf course, which has won many awards and hosted several championships. The prestigious course is set amongst natural beauty, and has dramatic elevation changes. Golf lessons are available for all ages, and there are advanced practice grounds including chipping, putting, pitching, and chopping areas. Professional caddies may be hired to assist in the game. Rosewood CordeValle has four plexicushion tournament-level tennis courts, lessons available for all levels of play, and ball machines for solo practice. Tennis balls and racquets may be rented. The Clos LaChance Vinery and Vineyard are on-site. All of the fruit is handpicked and sorted, resulting in the finest of wines. Tasting tours may be arranged. Rosewood CordeValle's Fitness Center is fitted out with treadmills, elliptical trainers, recumbent bicycles, personal flat-screen TVs, weights, and stretching equipment. Personal training and nutrition guidance are offered. The many hiking trails on the property allow guests to enjoy getting fit in the outdoors, and guests may enjoy guided hikes. The resort has an outdoor heated pool, with poolside service for sunbathers wishing cocktails, salads, sandwiches, or made-to-order thin-crust pizza. Rosewood CordeValle welcomes children, and is able to provide for them and their parents in an exceptional manner. Full-sized cribs and crib bedding are available upon request, as are in-room bottle warmers, wireless baby monitors, change tables, and diaper pails. Staff will gladly assist in baby-proofing guest rooms, and babysitting may be arranged. The resort's restaurants and room service menus offer children's meals, and golf lessons for kids can be arranged through the golf shop. Little ones will enjoy dressing up in child-sized lush velour bathrobes and slippers. The Sense Spa offers facials, scalp and foot massages, and full body massages for children; a parent must accompany their child in the spa at all times. Rosewood CordeValle is a pet-friendly property where dogs are happily welcomed. Dog walking and dog-sitting are offered, and the guest room will contain a custom dog bed, food, water, and doggy treats.